Now that the market is turning…. I want to sell !! As the market begins to swing a bit closer to favoring the seller, it is still a LONG……, way until we get to the solid multiple offer situations that we as agents and you as a seller want to see. It is however a great idea to feel now and to have possibly already sold within the past few months. As a previous blog post noted “The Perfect Storm” still applies even as the interest rates have went up (from about 3.5% to 5% for FHA in a matter of weeks) considerably, (that is a completely different topic) they are still at the point that a purchase as opposed to a lease makes more sense. 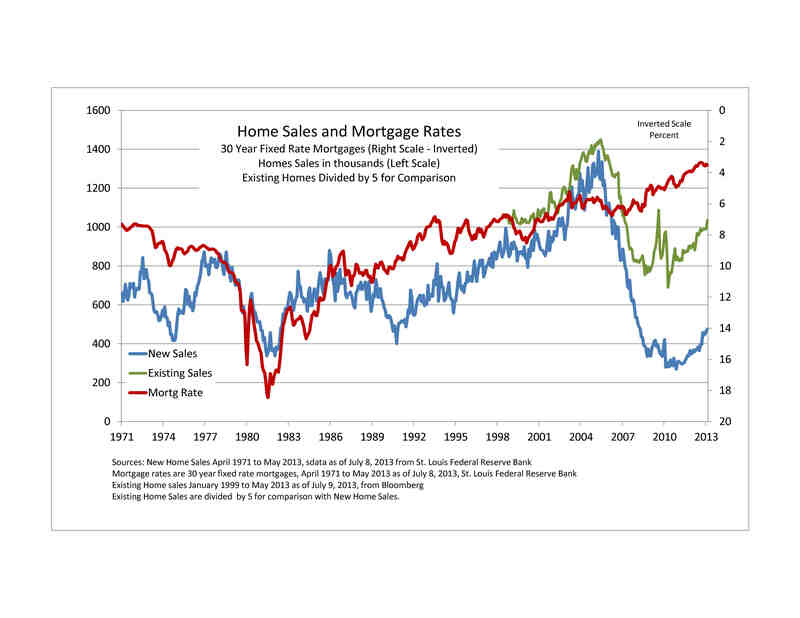 This graph shows that even with modest increases in interest rates, sales of both new and existing homes continue to rise (eating up the surplus inventory that was out there (a lot of houses to sell). As we move out of an obscenely amount of foreclosures and short sales into “typical” home sales, the prices begin to “normalize”, whatever that means. Now how does this effect YOU, the home seller. 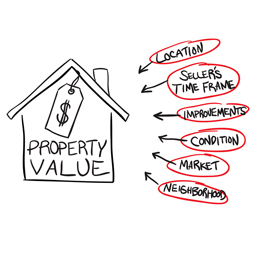 Now onto the selling, I gathered some valuable tips to help you navigate through this process to get the most for your home in the shortest amount of time for the highest NET value. These tips are a variation of Tara-Nicholle Nelson’s past article with several update editions and personalizations as well. These tips are in no particular order but should ALL be considered when selling. Get real about pricing: Today’s buyers are very educated about the comparable sales in the area, which heavily influence the fair market value of your home. They also know that they’re in the driver’s seat. To make your home competitive, have your broker or agent get you the sales prices of the three most similar homes that have sold in your area in the last month or so, then try to go 10-15% below that when you set your home’s list price. The homes that look like a great deal are the ones that get the most visits from buyers and, on occasion even receive multiple offers. (Bidding wars do still exist!) Broker’s Opens are a very good way to get feedback from Real Estate Professionals on things like pricing , staging and possible negative/ positive prospectives of your home. Just like you want a deal, so does everyone else. The irony of good business is that when buying something you want to best (cheapest) price with the best value, but when you are in sales you look to get the best(highest) price for your product with the least amount of “investment”. Notice the dual definition of BEST. Let your neighbors choose their neighbor: If you belong to neighborhood online message boards or email lists, send a link to your home’s online listing to your neighbors. Also, invite your neighbors to your open house – turn it into a block party. That creates opportunities for your neighbors to sell the neighborhood to prospective buyers and for your neighbors to invite house hunters they know who have always wanted to live in the area. Some home sellers hesitate with this idea because they have “nosy neighbors” that just want to see what you have, but you have to also understand that often people have people or know people (or family) that may want to live where they live and a neighbor’s friend or family member may very well buy your home. I lived two block from my mother for a bit and just sold a property on my mother’s block to a lovely couple that lived just two blocks away. Leave some good stuff behind: We’ve all heard about closing cost credits, but those are almost so common now that buyers expect them as they don’t really distinguish your house from any of the other homes on the market anymore (especially in the FHA, PHFA mortgage market we are in). What can distinguish your home is leaving behind some of your personal property, ideally items that are above and beyond what the average homebuyer in your home’s price range would be able to afford. That may be stainless steel kitchen appliances or a plasma screen TV, custom built-ins or shelves, or it might be a golf cart if your home is on a golf course or even a home warranty. Beat the competition with condition: In many markets, much of the competition is low-priced foreclosures and short sales. As an individual homeowner, the way you can compete is on condition. Consider having a termite inspection or home inspection in advance of listing your home, and get as many of the repairs done as you can – it’s a major selling point to be able to advertise a very low or non-existent pest repair bill. Also, make sure that the little nicks and scratches, doorknobs that don’t work, and wonky handles are all repaired before you start showing your home. Check up on your agent’s online marketing: 92% of homebuyers start their house hunt online, and they will never even get in the car to come see your home if the online listings aren’t compelling. In real estate, compelling means pictures! A study by Trulia.com shows that listings with more than 6 pictures are twice as likely to be viewed by buyers as listings that had fewer than 6 pictures. You also should make sure you have a robust online presence through any services your agent can provide. Ask them about where their house will be seen. Social media included, The law of multiples greatly extend the reach of your property if they utilize Social Media Outlets like: Facebook,Instagram,Path, Twitter, LinkedIn, Google+, Foursquare, Tumbler, Vine and any others. Craigslist and YouTube should also be utilized. Stage the exterior of your home too: Stage the exterior with fresh paint, immaculate landscaping and even outdoor furniture to set up a Sunday brunch on the deck vignette. Buyers often fantasize about enjoying their backyards by entertaining and spending time outside. Access is essential: Homes that don’t get shown don’t get sold. And many foreclosures and short sale listings are vacant, so they can be shown anytime. Don’t make it difficult for agents to get their clients into your home. If they have to make appointments way in advance, or can only show it during a very restrictive time frame, they will likely just cross your place off the list and go show the places that are easy to get into. Lockboxes are the best situation. I know many home owners don’t want a lockbox because they want either the agent or themselves there to guard their belongings. However there is very good tracking of showings usually online and electronically to track down an agent that showed you home and the property is not as it was for any reason. One more time: LOCKBOX !! Post a video love letter about your home on YouTube: Get a $125 FlipCam and walk through your home AND your neighborhood, telling prospective buyers about the best bits – what your family loved about the house, your favorite bakery or coffee shop that you frequented on Saturday mornings, etc. Buyers like to know that a home was well-loved, and it helps them visualize living a great life there, too. De-personalize and De-clutter: Pretend you’re moving out, because we home that you soon will be (The Secret). Take all the things that make your home “your” personal sanctuary (e.g., family photos, religious décor and kitschy memorabilia), pack them up and put them in storage. Buyers want to visualize your house being their house – and it’s difficult for them to do that with all your personal items marking the territory as yours. You want it to present well, but not to be overpowered by your personal style. Staging is very valuable but not when it is overstated. Keep the faux-moving in motion. Pack up anything that is sitting on top of a countertop, table or other flat surfaces that you don’t use regularly. This is especially important in baths and kitchens. Anything that you haven’t used in at least a year? That goes, too. Give away what you can, throw away as much as possible of what remains, and then pack the rest to get it ready to move. Listen to your agent: If you find an experienced real estate agent to list your home, who has a successful track record of selling homes in your area, listen to their recommendations! Find an agent you trust and follow their advice as often as you can. Most people feel that being a Real Estate agent is very easy and you only need them for the paperwork. They DO have a set of SKILLS and EXPERTISE that are valuable. This is what they do. Don’t you hate when a lay person thinks they can step in and do what you do as a Monday morning quarterback? Well, we all to stick to what we work and know and trust the process. Posted by dirktherealtor on July 28, 2013 in Uncategorized and tagged advertising, Business, Facebook, ghborhood, home sales, instagram, mortgage, neighbors, Path, property, property value, Real estate, surplus inventory, Tumbler, Twitter, Vine, youtube.